I’m not sure how I came across this recipe, but I’m sure glad I did! Not only did I think it was fantastic, but it was it a huge hit at the office as well. And since it’s yet another spectacular recipe from Baked, you can believe I’ll be checking out the bakery next time I’m in NYC! 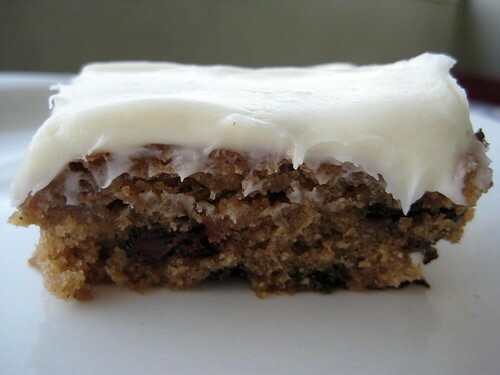 Referring to this as a cake is a bit misleading–it’s more like a 9×13 pan full of delicious, addictive, chewy oatmeal cookie with chocolate chips topped with cream cheese frosting. I know, how can it possibly be bad? Note: Until this recipe, I’d never made anything that required pouring hot water over oats and butter, so I found this a little strange. Also, my oat mixture got got a little gummy while it was cooling, so I wonder if I should have used slow cooking rather than quick cooking oats. Anyone know? Preheat the oven to 375 degrees and position the rack in the center. Butter the sides and bottom of a 9 x 13 inch glass or light-colored metal baking pan. Heat 1 1/4 cups water to boiling. Place the chocolate chips in a small bowl and toss them with the vanilla until covered. Sprinkle 2 tablespoons of the flour over the chips and toss until coated. This will keep them from settling at the bottom during baking. Set aside. Place the oats and cubed butter in a large bowl. Pour the boiling water over the oat mixture, wait 30 seconds, and stir to moisten all the oats and melt the butter. Set the mixture aside for 25 to 30 minutes. In a separate bowl, whisk together the eggs, both sugars, salt, baking soda, baking powder, and cinnamon until combined. Fold in the cooled oatmeal and stir until well combined. Gently fold in the remaining flour and then chocolate chops. Pour the batter into the prepared pan. Bake the cake for 25-30 minutes, or until a toothpick inserted in the center comes out clean. Let the cake cool in the pan on a wire rack for at least 30 minutes. In the bowl of a standing mixer fitted with the paddle attachment, beat the butter until it is completely smooth. Add the cream cheese and beat until combined. This looks so evil. In a good way! mixer has been so lonely. I think it’s time to get it out and make this sweet treat. Thanks! I’m going to make this on Sunday night for a co-worker’s birthday celebration on Monday…can’t wait! Just made it for our Super Bowl party, it is a huge hit!!!! Thanks, LOVE IT!!! Molly, glad you liked it! Crazy addictive, right?